Frederick II of Prussia (Frederick the Great) (24 January 1712―17 August 1786), a strong supporter of benevolent despotism, built his magnificent rococo palace in a 290-hectare park in Potsdam, just southwest of Berlin, between 1745-1747 as a respite from the official court in Berlin. Its very name comes from the French phrase sans souci, which means “without a care” and “carefree,” i.e., “sorgenfrei” and “unbeschwert.” It’s important to know that rococo was an 18th-century art movement that emphasized lissome, clever, and witty ornamentality, and is more or less the antithesis of and a reaction to baroque. “Old Fritz,” as he was lovingly called, said “I have lived as a philosopher and wish to be buried as such, without circumstance, without solemn pomp, without splendor. I want to be neither opened nor embalmed. Bury me in Sanssouci at the level of the terraces in a tomb which I have had prepared for myself . . . . Should I die in time of war or whilst on a journey, I should be buried in the first convenient place and brought to Sanssouci in the winter.” It took a long, long time―205 years―for people and events to honor his wishes. His tomb is now finally where he wanted it to be and it is certainly worth a visit―a modest resting place for one of Germany’s two or three greatest leaders. The Picture Gallery is not the only reason to visit Sanssouci, but it should be your primary reason. Beyond that, there is the Sanssouci Park and all its buildings that are works of art, in and of themselves and in their own right. I will provide a somewhat detailed listing below; first, however, a few highlights of the Picture Gallery. Among the artists and styles favored by “Old Fritz” were Antoine Watteau, history paintings, renaissance art, so-called mannerism art, and baroque art. The Picture Gallery includes superb representations thereof as well as many, many additional works. Five representative works of the Picture Gallery are Anthony Van Dyck’s The Descent of the Holy Spirit, oil on canvas; Johann Christoph Frisch’s Frederick the Great at his Tomb at Sanssouci with the Marquis d’Argens; Caravaggio’s The Incredulity of Saint Thomas; Anton von Werner’s The Opening of the Reichstag; and the extravagant profusion of all the so-called Fridericianum Baroque. 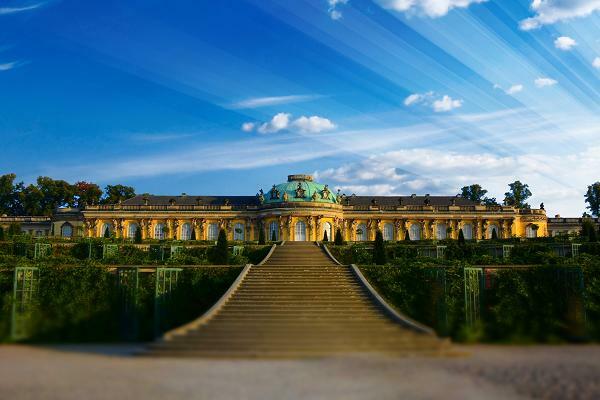 Sanssouci Park is open every day from 0600 until sunset and entry is without charge. The Evangelical Church of Peace, dating from 1845, behind which is the Lagoon of Peace, is just within the Green Gate, which is the park’s main entrance and quite near the Potsdam city center. Within the church’s apse, look for the spectacular 13th-century Venetian mosaic of Jesus, Mary, John the Baptist, St. Peter, and the martyred St. Cyprian of Carthage. Stroll west several meters and turn north through a bower and across a peaceful stream towards the Palace. Your first stop is the Garden of Delight (“Lustgarten”). Beyond this point is the Weinbergterrassen and the Sanssouci Palace proper, while off to the right are the Picture Gallery and, slightly farther east, the Neptune Grotto. Beyond, i.e., just north of the Sanssouci Palace, the path will take you to the relaxing Steed Fountain and then on to the historical Sanssouci Mill and the Weinstube, across from the Neue Kammern. Farther along Maulbeerallee on the right is the famous 300-meter-long Orangery. The central building of the Orangery, from which two wings extend, contains numerous paintings (almost 50) by Raphael in the so-called Raffael Hall. The building also accommodates government offices, luxurious living quarters, and, in the dead of winter, sensitive plants that need a bit of succor. Additional sights include the New Palace, Charlottenhof Castle, Dragon House, the Roman Baths, the Chinese Teahouse, the Belvedere, and the Ruinenberg, a 74-meter high hill that continues to play a significant role in drawing visitors to Sanssouci, particularly for the incredible view from the top of the artificial ruins commissioned by Frederick the Great afford over the surrounding area. When contemplating your visit to Sanssouci, remember that it is all a museum and that the museum we know as Sanssouci contains a significant treasure in its core: The Picture Gallery. For additional information, go to http://www.potsdam-park-sanssouci.de/home.html.